J.R. Todd claimed the Funny Car point lead via his second consecutive national event victory Sunday at the 34th annual Dodge NHRA Nationals, Round 1 of the Countdown to the Championship playoffs. Steve Torrence (Top Fuel), Vincent Nobile (Pro Stock) and Hector Arana Jr. (Pro Stock Motorcycle) also emerged as winners in their respective categories at the first of six playoff events during the 2018 NHRA Mello Yello Drag Racing Series Countdown. Two weeks after winning the prestigious 64th annual U.S. Nationals at Indianapolis for the second consecutive year, Todd covered the 1,000-foot distance at Maple Grove Raceway near Reading, Pa., in 3.972-seconds at 319.90 mph to defeat Tim Wilkerson’s 4.196 at 249.95. Todd, driver of the yellow Toyota Camry fielded by Kalitta Motorsports and most closely associated with the late Scott Kalitta, posted his fourth win of the season and 12th of his career. It also marked the 100th career win for Kalitta Motorsports and team-owner Conrad “Connie” Kalitta. Todd, who replaced No. 1 playoff seed Courtney Force as the class leader, now has a 23-point lead over two-time/reigning world champion Robert Hight of John Force Racing. Todd beat Bob Tasca III, Mike Smith and 2016 world champ/2017 event-winner Ron Capps to reach the final. Wilkerson defeated Terry Haddock, 16-time world champ John Force and Hight to secure his 41st career final-round and move to sixth in the point standings. In Top Fuel, No. 1 seed Torrence maintained his point lead after covering the 1,000-foot distance in 3.819-seconds at 325.45 mph to beat Tony Schumacher’s 4.196 at 234.82. Torrence notched his sixth victory of 2018 and 22nd of his career in his Torrence Racing dragster. En route to his 36th career final round, Torrence knocked off Bill Litton, Mike Salinas and No. 1 qualifier Clay Millican, opening up a 50-point lead over Schumacher and Millican via his first career victory at Maple Grove. Eight-time world champion Schumacher of Don Schumacher Racing advanced to his seventh career final round at Maple Grove and 152nd in his career in the U.S. Army dragster after defeating Dave Mercier, Scott Palmer and three-time world champion/DSR teammate Antron Brown. “The Sarge” also moved into a tie for second in points with Millican. Pro Stock’s Nobile posted his third victory of the season and 13th of his career in his Chevrolet Camaro SS after covering the traditional quarter-mile in 6.586-seconds at 210.01 mph opposite Drew Skillman’s 6.580 at 211.53. 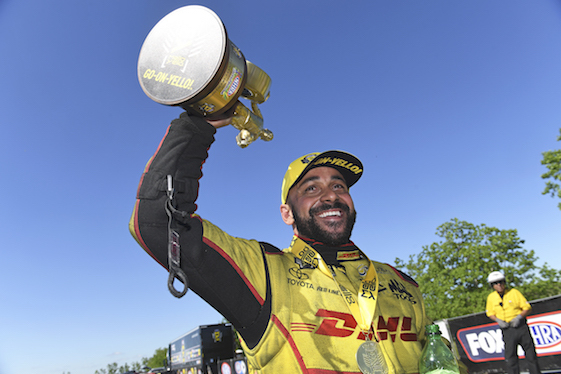 Nobile _ who trailered Matt Hartford, two-time world champ Erica Enders and four-time world champ Greg Anderson to reach his 25th career final round _ moved into second in the standings with his second career win at Maple Grove. Skillman was seeking his first victory of the 2018 season, but did climb to fifth in points after beating Fernando Cuadra, reigning world champion/event winner Bo Butner and point-leader Tanner Gray on Sunday. Gray, the No. 1 seed, maintained his lead and holds an 18-point advantage over Nobile. In Pro Stock Motorcycle, Arana Jr. earned his second victory of 2018 and 13th of his career with a quarter-mile run of 6.842-seconds at 197.74 mph aboard his Lucas Oil Racing TV EBR against No. 1 qualifier Matt Smith, who slowed to a 7.306 at 145.88. Arana Jr. jumped to second in points after his second career win at the track, and trails four-time/reigning world champion Eddie Krawiec by just three points. Arana Jr. posted wins against Ron Tornow, Joey Gladstone and point-leader Krawiec en route to the final. Smith’s path to his 47th career final-round included victories against John Hall, Steve Johnson and 2010 world champ LE Tonglet, as he improved to third in the point standings. The postseason continues Sept. 21-23 with Round 2 of the Countdown, the seventh annual AAA Insurance NHRA Midwest Nationals at Gateway Motorsports Park in Madison, Ill.
Top Fuel _1. Steve Torrence; 2. Tony Schumacher; 3. Clay Millican; 4. Antron Brown; 5. Scott Palmer; 6. Mike Salinas; 7. Leah Pritchett; 8. Doug Kalitta; 9. Terry McMillen; 10. Audrey Worm; 11.Brittany Force; 12. Jim Maroney; 13. Dan Mercier; 14. Bill Litton; 15. Dom Lagana; 16. Richie Crampton. Funny Car _1. J.R. Todd; 2. Tim Wilkerson; 3. Robert Hight; 4. Ron Capps; 5. Tommy Johnson Jr.; 6. John Force; 7. Cruz Pedregon; 8. Mike Smith; 9. Shawn Langdon; 10. Matt Hagan; 11. Jonnie Lindberg; 12. Courtney Force; 13. Jack Beckman; 14. Terry Haddock; 15. Jim Campbell; 16. Bob Tasca III. Pro Stock _1. Vincent Nobile; 2. Drew Skillman; 3. Tanner Gray; 4. Greg Anderson; 5. Bo Butner; 6. Jeg Coughlin Jr.; 7. Jason Line; 8. Erica Enders; 9. Matt Hartford; 10. Kenny Delco; 11. Alan Prusiensky; 12. Val Smeland; 13. Deric Kramer; 14. Fernando Cuadra; 15. John Gaydosh Jr.; 16.Chris McGaha. Pro Stock Motorcycle _1. Hector Arana Jr.; 2. Matt Smith; 3. LE Tonglet; 4. Eddie Krawiec; 5. Andrew Hines; 6. Steve Johnson; 7. Joey Gladstone; 8. Angie Smith; 9. Scotty Pollacheck; 10. Jerry Savoie; 11. Mark Paquette; 12. Jim Underdahl; 13. Angelle Sampey; 14. Ryan Oehler; 15. John Hall; 16. Ron Tornow. Top Fuel _ Steve Torrence, 3.819-seconds, 325.45 mph def. Tony Schumacher, 4.196-seconds, 234.82 mph. Funny Car _ J.R. Todd, Toyota Camry, 3.972, 319.90 def. Tim Wilkerson, Ford Mustang, 4.196, 249.95. Pro Stock _ Vincent Nobile, Chevy Camaro, 6.586, 210.01 def. Drew Skillman, Camaro, 6.580, 211.53. Pro Stock Motorcycle _ Hector Arana Jr., EBR, 6.842, 197.74 def. Matt Smith, EBR, 7.306, 145.88. Top Alcohol Dragster _ Troy Coughlin Jr., 5.328, 272.89 def. Josh Hart, 5.366, 273.66. Top Alcohol Funny Car _ Sean Bellemeur, Chevy Camaro, 5.489, 268.28 def. Phil Burkart, Camaro, 5.745, 261.52. Competition Eliminator _ Tom Martino, Chevy Cobalt, 8.652, 147.13 def. Jay Schonberger, Olds Cutlass, 8.184, 160.94. Super Stock _ Anthony Bertozzi, Pontiac Grand Am, 9.062, 135.46 def. Anthony Bongiovanni, Ford Mustang, 8.919, 153.30. Stock Eliminator _ Shane Oakes, Chevy Camaro, 11.144, 113.83 def. Anthony Fetch, Camaro, 10.075, 118.21. Super Comp _ Mike Robilotto, Dragster, 9.027, 174.96 def. Chris Garretson, Dragster, 8.893, 129.23. Super Gas _ Ray Sawyer, Chevy Camaro, 9.932, 175.62 def. Dale Koncen, Chevy Corvette, Foul/Red Light. FINAL _ Torrence, 3.819, 325.45 def. Schumacher, 4.196, 234.82. FINAL _ Todd, 3.972, 319.90 def. Wilkerson, 4.196, 249.95. FINAL _Nobile, 6.586, 210.01 def. Skillman, 6.580, 211.53. FINAL _ Arana Jr., 6.842, 197.74 def. M. Smith, 7.306, 145.88. Top Fuel _1. Steve Torrence, 2,219; 2. (tie) Clay Millican, 2,169; Tony Schumacher, 2,169; 4. Leah Pritchett, 2,118; 5. Antron Brown, 2,116; 6. Doug Kalitta, 2,103; 7. Mike Salinas, 2,067; 8.Terry McMillen, 2,062; 9. Scott Palmer, 2,053; 10. Brittany Force, 2,052. Funny Car _1. J.R. Todd, 2,166; 2. Robert Hight, 2,143; 3. Courtney Force, 2,141; 4. Ron Capps, 2,137; 5. Matt Hagan, 2,112; 6. Tim Wilkerson, 2,101; 7. Tommy Johnson Jr., 2,090; 8. Jack Beckman, 2,080; 9. John Force, 2,064; 10. Shawn Langdon, 2,054. Pro Stock _1. Tanner Gray, 2,183; 2. Vincent Nobile, 2,165; 3. Greg Anderson, 2,153; 4. Erica Enders, 2,131; 5. Drew Skillman, 2,128; 6. Jeg Coughlin Jr., 2,127; 7. Jason Line, 2,073; 8. Deric Kramer, 2,072; 9. Bo Butner, 2,064; 10. Chris McGaha, 2,032. Pro Stock Motorcycle _1. Eddie Krawiec, 2,184; 2. Hector Arana Jr., 2,181; 3. Matt Smith, 2,147; 4. LE Tonglet, 2,144; 5. Andrew Hines, 2,137; 6. Jerry Savoie, 2,082; 7. Steve Johnson, 2,073; 8. (tie) Scotty Pollacheck, 2,062; Angie Smith, 2,062; 10. Angelle Sampey, 2,033.